I am at my wits end. I’ve tried for weeks and have searched tons of articles and tried many different things and I can not get this zwave stick to work. I am running a new Raspberry Pi 3B+ and hassbian appears to be running perfectly fine. I have an Aeotec Gen 5 Zwave stick and it has all been working and running zwave entities fine a month ago. I ended up doing a complete reinstall for some reasons which don’t really matter and now I can’t (starting from scrath) add my zwave stick. I’ve even done a complete reset of the stick and I still can’t figure out how to add it. I have a feeling something is wrong with the USB path, but even that seems to be too difficult for me to figure out. Can someone please help? I am eager to learn and I’m truly hoping I can gain some traction with the help of this awesome community. If this question is worded incorrectly or tagged/placed in the wrong location, I apologize. And if I am forgetting any important info please let me know and I’ll add it. Thanks! p.s. when I look at other similar topics I do not find any recent discussions on using hassbian with a rpi3B+ and adding an aeotec zwave stick. I am definitely not the xpert of Z-Wave, but what makes you suspect the USB port? It would help to know your configuration? Are you running a Raspian system, Hassos on resin, Docker on a PC? Installation of the Z-Wave component. One of those options has always worked for me. This is how I prefered to do it on hassbian as you didn’t have to work about the path changing and it was simpler than making the path static. What I did was ssh to the host and ran ls -al /dev/serial/by-id. That will list all of your serial devices and their symlinks to the /dev/tty* device. Just update your Home Assistant config to point to the correct device using /dev/serial/by-id/DEVICENAME and you should be good to go. I’ll try this as soon as possible and report back how it works. Thank you so much for the tip! So far this is the most progress I’ve made in months. 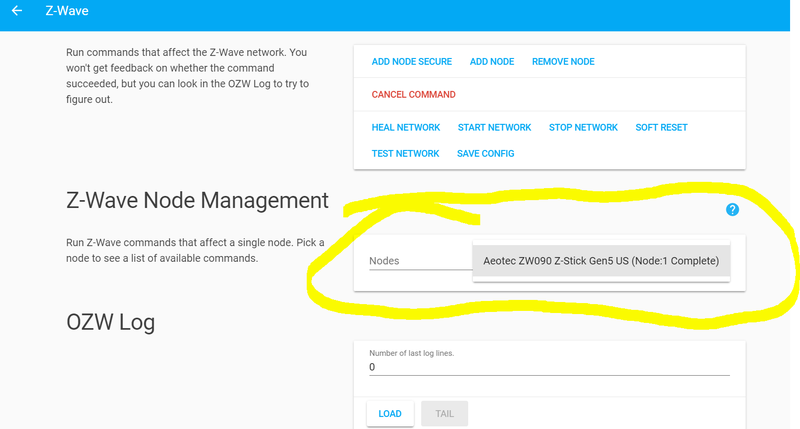 I’m finally able to see my Aeotec Z-Wave stick added as a node! Now to start trying to add other zwave devices. Thank you so much man! Well @stevemann, I am still having issues so if you think you have an idea- I would love some input. 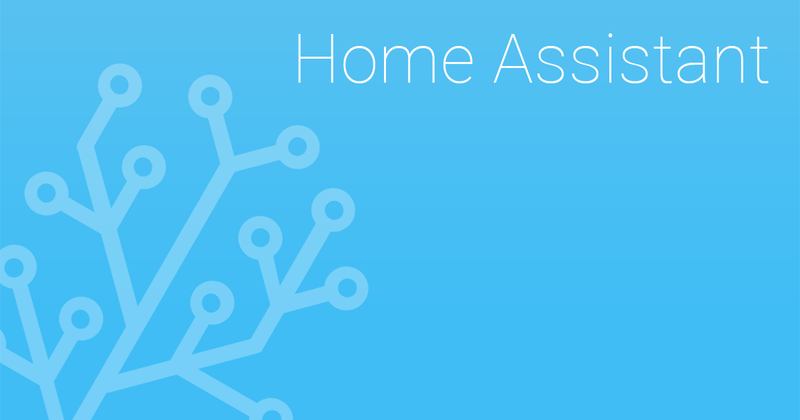 To answer your previous question I am running hassbian installed image from this link: https://github.com/home-assistant/pi-gen/releases/tag/v.1.5.0 and I have a new Rpi3B+. Does that describe my configuration well enough? Current issue now is that I can’t add nodes. I have done this before and I have troubleshooted what I can. I never did remove nodes last time before I wiped my SD card clean to start over, could that be the issue? @silvrr I seem to be having issues adding nodes, which is new for me because In my short experience I never had issues of adding nodes before. Any guidance beyond what is already on the documentation? 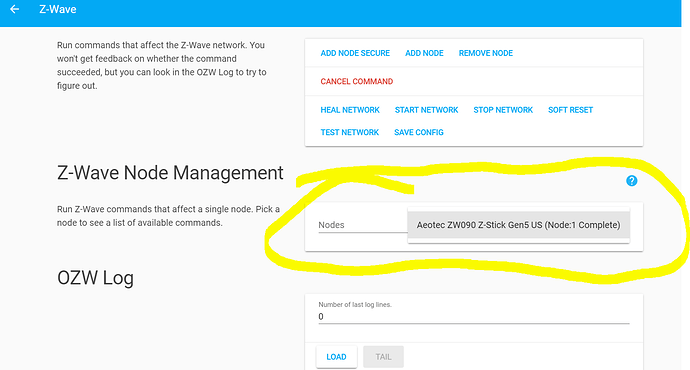 Use the UI to add a node and get the device as close as possible to your zwave stick. Does that describe my configuration well enough? Repeat- I am not an expert. I keep copious notes when I install anything, but installing Z-Wave was so simple that I didn’t even make notes. I just put the Z-Wave component in my configuration.yaml file then used the Home Assistant Z-Wave configuration page. As Silvrr said, the new nodes have to be pretty close- within one hop. I just wired the switches to an extension cord that I cut the plug off. This way, I could put the switch 5 ft from the Z-Stick for it to be initially found. That probably wasn’t necessary since I installed a Shelly switch downstairs (my Z-stick is upstairs) and Home Assistant found it two hops away. Current issue now is that I can’t add nodes. Do you get errors? How are you adding nodes? Beginners mistake, I did not reset my previous devices. Thank you all so much for the help! I’m now on to different issues I’ll look into in other threads. Thank you all again!